I congratulate most heartily Swam! Madhavananda on his English translation of the Vedanta Paribhãsa. I also appreciate the annotations that he has given. The Vedanta Paribhasa is an epistemological work on Samkara Vedanta as interpreted in the Vivarana school, The epistemological implications of the Panca-padika of Padmapada as interpreted in the Vivarana, had alreday been collected and worked out by Ramadvaya in his Vedanta Kaumudi. The work has not yet been published. When we compare the contents of the Vedãnta Kaumudi with those of the Vedanta Paribhasa of Dharmarajadhvarindra, the indebtedness of the latter appears to be so colossal that its claim to originality vanishes. There are also here and there traces of confusion which his son vainly tried to justify or to explain away in his commentary on the Vedanta Paribhdasä. On the whole, this epistemological compendium on account of its brevity and lucidity of exposition has commended itself to the readers of Sathkara Vedanta. It is also interesting to notice that in accordance with the stheme of epistemology formulated in the Vivarana, the perceptual situation is taken in a realistic manner. Parts of it, however, are not fully developed, and important questions which could be raised regarding it have not been anticipated. This may be regarded as a hypercriticism but it cannot be denied that there is much scope for elaborating the views of the Vivarana school on epistemological matters. 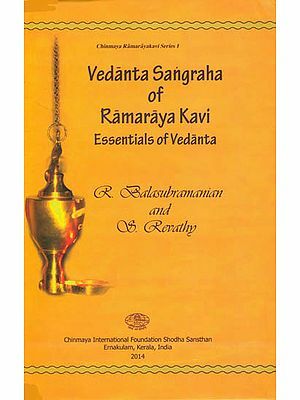 This English translation of the Vedanta Paribhasa will introduce the epistemology of the Samkara Vedanta to such readers as are not adepts in philosophical Sanskrit. The public owe a deep debt of gratitude for this work to Swami Madhavananda. It is also very gratifying to see that the Ramakrsna Mission that has become so famous in the country for social service has also turned its attention toward intellectual service in such a significant work as the present one and many other translation that the learned author has done. The third edition of this reputed book having long been run out we are now bringing out the fourth edition we are sorry it could not be printed earlier due to some unavoidable circumstance. We are however glad to place the book at the disposal of reading public. The Vedanta Paribhasa by Dharmaraja Adhavarindra is a very important manual of the Vedanta philosophy and is the most widely read book on the subject next to Sadananda Yogindra’s Vedanta Sara. The Author who seems to have flourished in the seventeenth century was a reputed scholar of Southern India as we know from the introductory verses to the Paribhasa as also from similar verses by his son and commentator. And we have ample evidence from the body of the book that of the two main branches of the Sankara school of Advaita Vedanta founded by Padmapadacarya and Acarya Vacaspati Misra respectively our author belonged to the former. In his discussions he has adopted the method and phraseology of Navya Nyaya introduced by Gangesa Upadhyaya in the fourteenth century. The first six chapters of the Paribhasa are devoted to establishing the means of valid knowledge contain refutations of other systems of philosophy particularly Nyaya Vaisesika. Being to some extent of a polemical character these chapters are rather abstruse for the beginner. But once he has ascended these rugged steps he is ushered into the realm of Vedanta Proper in the last two chapters of the book where he will find a delightful compendium of the essential doctrines of the philosophy embodying its subject matter and aim. As regards the means of knowledge there is great divergence among the different systems of philosophy. For instance the Carvakas who are out and out materialists believe only in perception the Buddhists and the Vaissikas in perception and inference the Sankhya and Yoga Schools in perception inference and verbal testimony the Naiyayikas add to these comparison as well the Prabhakara school of Mimamsakas include presumption while the Vedantists along with the Bhatta School of Mimamsakas believe in six means of knowledge viz, perception inference comparison verbal testimony presumption and non apprehension. 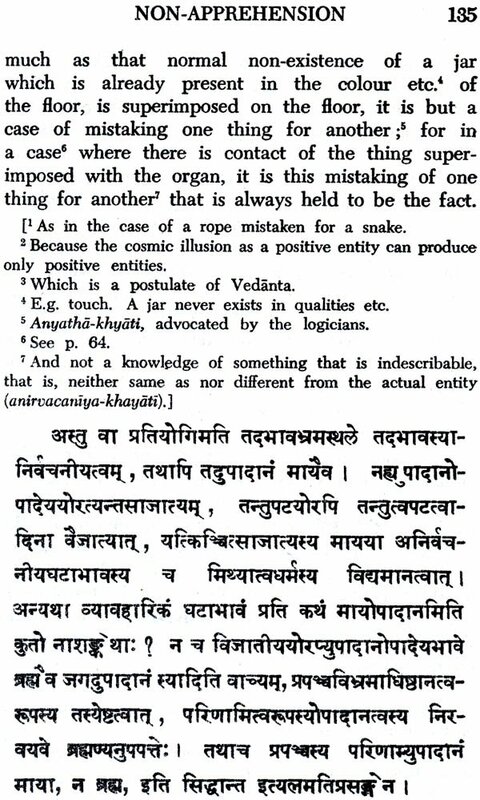 As against the Naiyayikas the Vedantins argue that presumption cannot be classed under inference for it is based on negative invariable concomitance which Vedanta does not admit while non apprehension cannot come under perception for according to the logicians it presupposes contact of the organ with the object but non existence cannot come in contact with the organ. Again with regard to the conception of knowledge Nyaya holds that knowledge is a product of the contact of the mind with the self while according to Vedanta it is eternal Pure consciousness only it is manifested through mental states. The Vedantin’s theory of perception is in sharp contrast with the Naiyayika’s Vedanta holds that pure consciousness has three forms as associated with the subject or knower or consciousness limited by the mind as associated with the object and as associated with the mental state and perception of any external object (that is present and capable of being perceived) takes place when these three occupy the same space by the mental state issuing through the organ and spreading over the object so as to assume a field through a channel and being shaped like the field. The mental state serves to remove the well of nescience from the consciousness associated with the object which is revealed by a reflection of the Consciousness associated with the subject (that is of the self which is of the nature of intelligence). Some Vedantists deny that the mind is an organ which is a perception of internal objects like pleasure and pain is done by the witness by which is meant that aspect of the self in which the mind instead of being a qualifying attribute is a limiting adjunct directly that is without the help of the mental state as in the case of external objects. On this point however our author differs. The distinction between a qualifying attribute and a limiting adjunct is this that the former affects (of course speaking from the phenomenal standpoint) the self while the latter only distinguishes it without affecting it in any way.